Take about 400 mg of magnesium on a daily basis. It is best for you to take it in equally divided doses. Also, it is better to use an organic form, such as magnesium ascorbate, magnesium citrate, amino acid chelate, or magnesium aspartate etc. You need to consume a full tablespoon of raw honey twice daily. You may do so either in the morning or in the evening. Take a tablespoon of psyllium husk powder and dissolve it in 250-300 ml of water. Drink it quickly, twice daily. If truth be told, this remedy is believed to be the simple, most effective natural home remedy among all of the countless known constipation remedies. This is because it focuses on sorting out the ultimate cause of this problem – low levels of O in the body, reduced perfusion (blood supply) of body cells, and spasm in the muscles of the digestive tract. It is basically an exercise that you can use for severe chronic constipation during pregnancy, for pain caused by constipation, for children and in a number of other situations as well. This is a natural and extremely easy breathing exercise that can help you relieve constipation, as well as its pain. It was initially invented by Soviet medical doctors, who tried it on thousands of their patients. To begin with, you need to take a slow inhalation using your abdominal muscles or belly in such a manner that it depicts filling up your belly with air. Now, exhale by relaxing your diaphragm. Through this slow and deep breath, you would actually be able to increase blood oxygen levels considering that a majority of people who suffer from constipation are chest breathers. At the end of your relaxed exhalation, you need to pinch the nose, and hold your breath to the point that you start experiencing strong air hunger. However, please avoid extended breath holding and use the easier version mentioned below if you suffer from panic attacks, heart disease, seizures and frequent migraines. Upon releasing your nose, do not follow your natural desire of taking a large and deep inhalation. Instead, take a shorter inhalation with the help of your diaphragm and relax it immediately. The basic aim here is to maintain strong levels of air hunger for nearly 1-2 minutes, while totally relaxing all of the muscles of your body. With the help of this exercise, your O2 and CO2 concentrations will increase, thereby relieving you of your constipation and pain. There is a different version of this breathing exercise that needs to be tried out by people of this group to get rid of constipation. 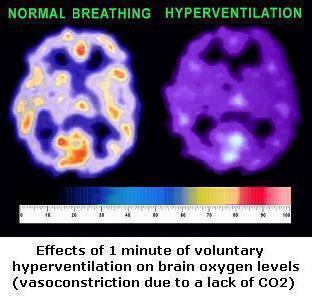 This is because they require gentler changes in O2 and CO2 in the blood and lungs. Instead of a sudden rise in CO2 in the blood, particularly during breath holding), such people need to start with the last part of the exercise by taking smaller inhalations. They should only focus on reduced breathing while slowly increasing their air hunger levels. Here’s a YouTube video that is surely going to help you with achieving relief for your constipation quickly. If you are interested in getting rid of chronic or severe constipation, then it is necessary for you to slow down your automatic breathing, and raise your body-oxygen levels to a minimum of 25 seconds 24/7. Normal body oxygenation, which is 40 s, is the medical standard for this test, and also happens to be the ultimate cure for all problems associated with chronic constipation.